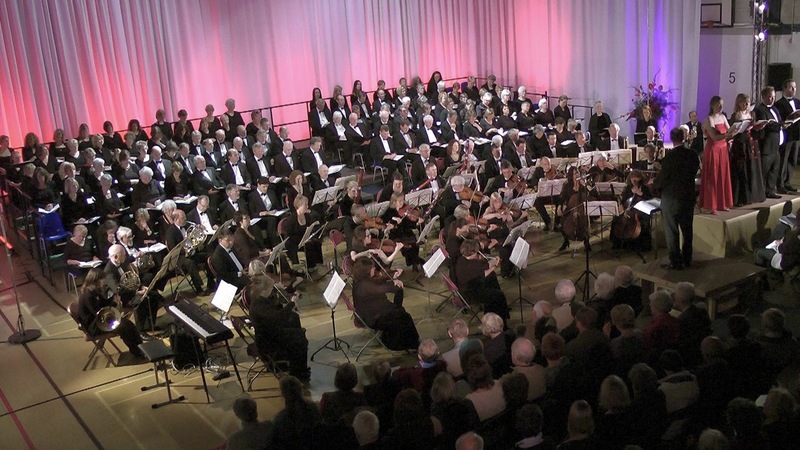 East Devon Choral Society celebrated its 40th anniversary by presenting a gala performance of music by Giuseppe Verdi last Saturday evening at Tiverton High School Sports Hall. The concert began with the orchestra playing the overture from Verdi’s ‘The Force of Destiny’ and finished with ‘Brindisi Chorus’ – (The Drinking Song) – from ‘La Traviata’, a chance for the soloists to let their hair down and to send us all home in a suitably celebratory mood. Central to the programme was Verdi’s monumental Requiem, a piece that is written for a double choir, full orchestra and four soloists. This is an ambitious piece for any music group to perform. As you would expect from the composer responsible for many of the world’s most famous operas, it is a Requiem full of drama, placing enormous demands on soloists, choir, orchestra and the conductor who must lead and inspire the multitude of performers under his baton. Andrew Daldorph has been directing the Choral Society for the past 10 years and Saturday’s performance demonstrated the strength of the choir under his direction. Of course Andrew inherited a choir that was well accustomed to tackling major works in the choral repertoire. Under Dr John Byrt, the choir’s director for the previous 28 years, there had been performances of Faure’s Requiem, Mendelssohn’s Elijah and Handel’s Messiah as well as John’s own compositions. There are very few things I find more affecting than a really strong choir singing with quiet passion. Verdi’s requiem is full of fireworks, but it was the restrained passages, when the conductor held in check the vast forces at his disposal, that sent shivers down my spine. The soloists were Claire Surman – Soprano, Alison Kettlewell – Mezzo-Soprano, Samuel Evans – Bass and Edward Hughes – Tenor. Edward Hughes replaced Iain Milne who was prevented from appearing by illness, but these are consummate professionals and this alteration made no difference to the strength of their performance. All four enjoy international success on opera and concert stages. For Claire Surman, this was a return home. Claire grew up in Tiverton and attended Tiverton School and East Devon College before moving on via a First Class Honours degree at Keel University to the Royal College of Music. Verdi is a composer who is a great master of musical colour and his full palette is displayed in the Requiem. With its quiet opening the Requiem seems to emerge from darkness into light, as if the dead for whom it is written step from the darkness of the grave into the light of the Last Judgement. The terrifying Dies irea – Day of wrath – with its four thunderous opening chords is followed by the tragic Lacrymosa dies illa – Day of weeping. The beautiful cello opening of the Offertorio ushers in a quartet whose soaring harmonies seem to offer comfort and hope and the possibility for resolution, but the soprano’s final, quiet almost desperate plea of Libera me –Deliver me, that concludes the Requiem, leaves us doubting the possibility of salvation and the dying phrase plunges back into the darkness and silence from which the Requiem emerged. This was a masterful performance, the four solo voices at times flying above, at times blending with the ever shifting moods of the chorus and orchestra. Tiverton is not a big town and yet here was a performance of ambition and stature that many cities would be proud to own. The performance was enhanced by its staging and by the welcoming atmosphere created by local students and volunteer ushers. For those of us who know the Sports Hall, the transformation was remarkable. A sweeping, white curtain, the full height of the building, dramatically lit from below, surrounded the choir and orchestra. Lighting towers had been installed and raised platforms for the spot-lit soloists and conductor. As we arrived, each member of the audience was greeted at the door by smiling ‘Ambassadors’ from the High School and despite the very large numbers, the volunteer bar staff served drinks to all who wanted them during the interval. The East Devon Choral Society first met 40 years ago at East Devon College following an advertisement placed in the Gazette by the then Principal, Clifford Dixon. This important relationship between the cultural and educational life of our community continues today as the mounting of this performance through a collaboration with Tiverton High School and the support of the recently formed Tiverton Community Arts Theatre demonstrates. It is to the great credit of the staff of the High School and College that they understand the importance of the Arts in maintaining a vibrant community and that creativity plays a vital role in the education of young people, something, sadly, our political leaders appear unable to grasp. The Choral Society’s performance displayed the wealth of local talent. We are very fortunate to have people in our community with the energy and vision to see that such talent is fostered and supported. 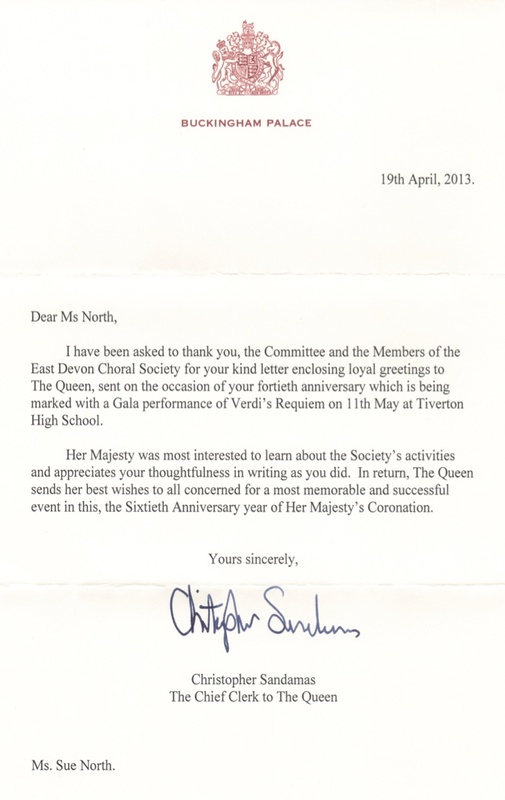 Let us all wish the East Devon Choral Society another 40 wonderful years. “I think I am a classical music convert”.